Matt C: Doomsday Clock #8 arrives this Wednesday, and the bimonthly schedule has started to slip a bit. I'm okay with that as the end product is so impressive, and to be honest it's so packed with narrative detail that even a regular monthly release would be too long a wait - it will really need to be consumed in one hit to fully appreciate its brilliance, probably multiple times. I don't have the same recall problems with Batman as it appears every fortnight, and if nothing else I will always remember that I'm due a corker every time it makes the list. The other major highlight from DC this week is Shazam! #1. As writer Geoff Johns has Gary Frank (his previous collaborator on the character in the short-lived but excellent New 52 run) working hard on the aforementioned Doomsday Clock, it leaves the door open for Dale Eaglesham to bring his talents to The Character Formerly Known As Captain Marvel, and the upcoming movie, along with Johns' obvious affection for Billy Batson and his alter-ego means this is one to watch. Image has a couple of books of note - Mark Millar's new series, Prodigy, and one I flagged up from Previews called Self Made - which both look like they're worth investigation, and Marvel have a new Winter Soldier series from two thirds of the team behind superb Image title, C.O.W.L. Also from Marvel is the start of a new set of True Believers book reprinting first appearances of some of the Fantastic Four's greatest villains. Still absolute bargains at a dollar each! Jo S: The first week of the month is definitely my favourite just at the moment; I'll be tearing the wrapper off my packet of comics apace as there are multiple riches therein to enjoy. A double dose of Batman swoops out of the traps ahead of the pack, and it must surely be tough to find two more different visions of the dark knight than these - Tom King scoring smash after smash this year with the classic Batman title, a very human, very visceral version in stark contrast with Sam Kieth's frankly bonkers Bat-team-up with the Maxx, where our extravagantly long-eared hero does battle with things that may only exist in his own mental Outback. 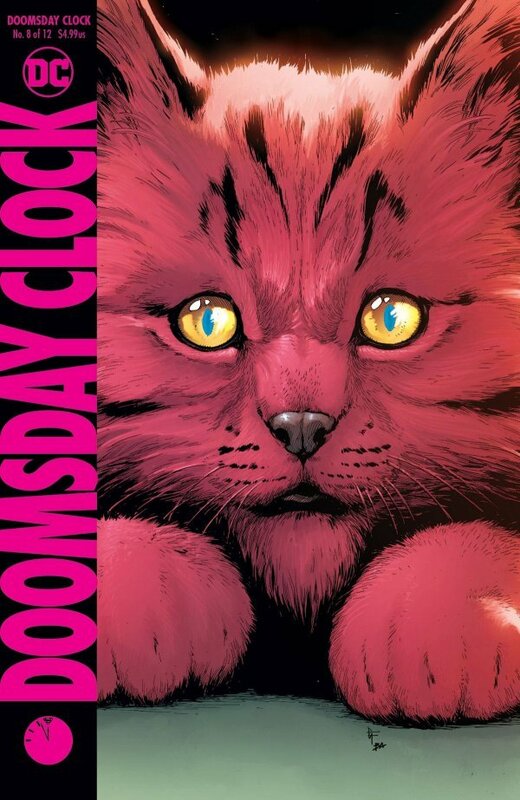 DC continues to maintain my attention as Doomsday Clock finishes its second trimester. Even bi-monthly, this still gives me enough to keep my brain busy well past the week of its release. A wave of Marvel tastiness then follows: Immortal Hulk has been more variable for me as the series has rolled out but I'm enjoying the ramped up action and the psychological complexity, and Marvel Knights: 20th has been a pleasant surprise so far, with an interesting idea for a story, told with skill. The weekly Uncanny X-Men routine pulled its socks up in issue#3 after not quite lighting my fire initially so I'll crack on with issue #4 of this, though it pales as a team book next to the outstanding West Coast Avengers - funny, insightful, moving in places; this story has ticked off every item on my team book desirables list and will be the one I most look forward to on Wednesday. And it wouldn't be a normal #NCBD for me without trying something new: a chance glimpse of some gorgeous sample art from Rod Reis showing the Winter Soldier apparently with a Robin-esque sidekick has snagged my interest in the new series from Reis and Kyle Higgins. Bucky is earning redemption through helping others to reform their lives which sounds like a very promising setup, but what could his new protégé be called? The Autumn Cadet? Ensign Blizzard? My money's on the Winter Soldier and… Snowflake!